“To the Farthest Ports of the Rich East,” is the motto of the city of Salem, Massachusetts. 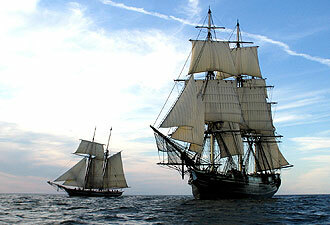 For almost 300 years, vessels sailed from Salem carrying dried codfish and timber to trade for goods around the world. Especially in the years after the American Revolution, Salem captains and mariners sailed as far away as India, China, and Japan, bringing exotic goods back to American and European markets, and made the city rich on the profits. That history can be seen, heard, touched, smelled, and tasted on Salem’s waterfront at Salem Maritime National Historic Site. Start your visit at the Salem Visitor Center, where you can see a movie on the history of Salem and Essex County, and the friendly rangers and volunteers can tell you about the city. They’ll direct you to the waterfront, where the Orientation Center shows a movie about Salem’s maritime heritage. Following the ranger’s directions, you’ll travel down Derby Street, where you will find a tall ship docked at Derby Wharf. 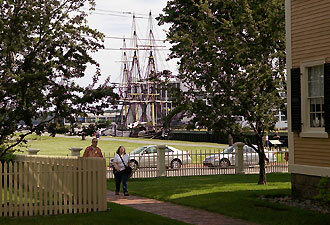 Welcome aboard Friendship of Salem, a replica of a cargo ship built in Salem in 1797. 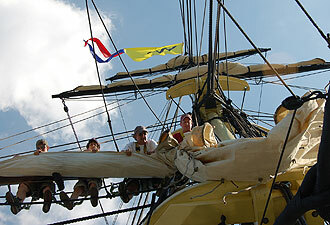 During the summer, Friendship is abuzz with activity, as our volunteers take to the rigging to help maintain the vessel and perhaps prepare her to sail. During your visit, rangers and volunteers might put you and your family to work at sailors’ jobs, including moving cargo, cranking the capstan, or manning the ship’s wheel. Below deck, you can try out a sailor’s bunk, or check out the great cabin and sleeping quarters for the officers. Across the street is the 1819 Custom House, with its magnificent golden eagle perched on the roof. It’s one of the three historic buildings that are on our guided tours and audio tour. On the tours, you’ll hear the stories of people such as author Nathaniel Hawthorne, whose bad experience as an employee in the Custom House became the introduction to his novel The Scarlet Letter, and Elias Hasket Derby and Elizabeth Crowninshield, who were given the beautiful Derby House as a wedding present in 1762. A walk out the half-mile-long Derby Wharf toward the lighthouse is the perfect stroll after the decadent meal you may have had at one of the dozens of restaurants within easy reach of Salem Maritime. At the end of Derby Wharf is a spectacular view of Salem Harbor. If you’re an early bird, sunrise on the wharf is a great way to start the morning. If you want to relax out of the sun, the shaded yards and gardens around the historic buildings at Salem Maritime are wonderful places to take a break. For a shopping treat, the West India Goods Store sells the types of goods that would have been brought in on Salem ships around 1800. As you open the door, the smell of coffee, tea, and exotic spices surrounds you, and just like Salemites 200 years ago, you can browse the porcelain, fabrics, books, candy, and other unusual items. Family activities take place throughout the summer, and are listed on our calendar. The Custom House eagle’s cartoon alter ego, Eglantine, is our Junior Ranger mascot, and kids can join her to earn a junior ranger badge with a booklet from the Orientation Center. On August 7, our annual Salem Maritime Festival will include music, children’s activities, and boat rides in the harbor! So plan your visit to Salem Maritime and learn about the seafaring stories of the early years of our country, and the men and women who made Salem a household name in ports all over the world.